Butser Hill has been upgraded to a Premium Site as we have now arranged gated access and use of the toilet facilities. So an annual Multi Site Pass will be required to access the site for observing. 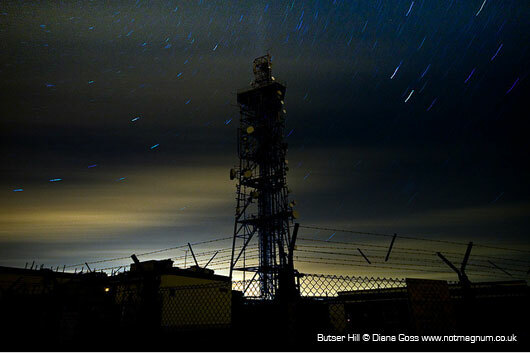 It has Mag20+ dark skies with stunning vistas of the South Coast spanning from Bognor to Fawley, which makes it ideal for astro-photography. The site is about 0.5 Mag behind Butser Ancient Farm in terms of darkness and regularly achieves Mag20+ due to it's elevation on a clear night. Butser is a chalk hill and one of the highest points in Hampshire. It's also the highest point on the chalk ridge of the South Downs and the second highest point in the South Downs National Park, after Blackdown in the Western Weald. Although only 271 metres (889 ft) high, it qualifies as one of England's 'Marilyns' (a Marilyn is a mountain or hill in the UK, with a height of at least 150 metres (492ft). Our observing area stands at 814ft above sea level making it one of the highest observing sites in the South of England, and the highest in Hampshire! It's located within the borders of the Queen Elizabeth Country Park, situated about three miles south of the historic market town of Petersfield, Hampshire, which is now part of the South Downs National Park. We normally observe here on a Sunday evening or sometimes for an ad-hoc observing session, if the weather is good. 2011 really is your year to get involved with astronomy. Join us and join in! For more info, if you have any questions or to buy an Annual Multi Site Pass, please e-mail Sharon our membership secretary: membership@hantsastro.org or call her on 023 9261 7092. J1 A3(M) Turn Right. At Roundabout, keep left and go past the Hampshire Hog Pub , turn left into Petersfield Road, turn first right in to Hog's Lodge Lane. At the Junction of North Lane turn right and continue up the hill. Enter the top car park (one with ticket machine) and drive through, turn right and drive to top of the hill where you can unload your gear. The observing site is opposite the kiosk/toilets. Please unload your equipment and park back in the car park as the gates must be kept clear at all times.